Last night’s season 9 debut of “American Idol” with new judge, comedian and talk show host, Ellen DeGeneres, has viewers buzzing. But, what many people don’t know is that Ellen was once a top pick for another singing game show. 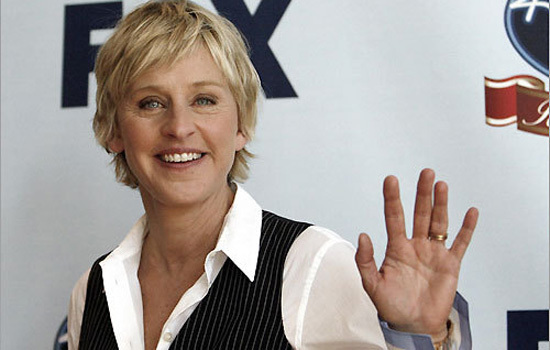 Before “Don’t Forget the Lyrics”, there was “Top of the Charts”, the show’s working title in which it was presented to network executives along with potential host, Ellen DeGeneres. A couple of run-through fake contestants were called-into the hotel conference room along with a small group of audience participants for atmosphere. It was during the second contestant, the now famed Katie/Kate or Stephanie that was outed as a professional game show contestant when she was linked with George Clooney back in 2009 was being extremely bubbly like any pro-game show contestant would be when DeGeneres was called-into the room. DeGeneres sat down and stayed for approximately fifteen minutes before getting up and walking-out. The room cleared another fifteen minutes later. Needless to say, it didn’t go well. The show did go on with funny man Wayne Brady, who currently hosts “Let’s Make a Deal”, and Katie or Stephanie parlayed her run-through into an actual game on “Don’t Forget the Lyrics” managing to croon her way to $350,000! Her other game show conquests include “Hollywood Squares”, “The Price is Right”, and “Trivial Pursuit”. Now four years later, I still can’t make the connection of DeGeneres with singing? Dancing, yes. But, singing. We’ll have to see how long she’ll stick around for “American Idol”.